Despite the widespread anxiety due to slowing growth momentum, the global economy is unlikely to face a recession this year, and high yield opportunities continue to exist in the US equity market and emerging markets, according to a US-based asset management company on Wednesday. 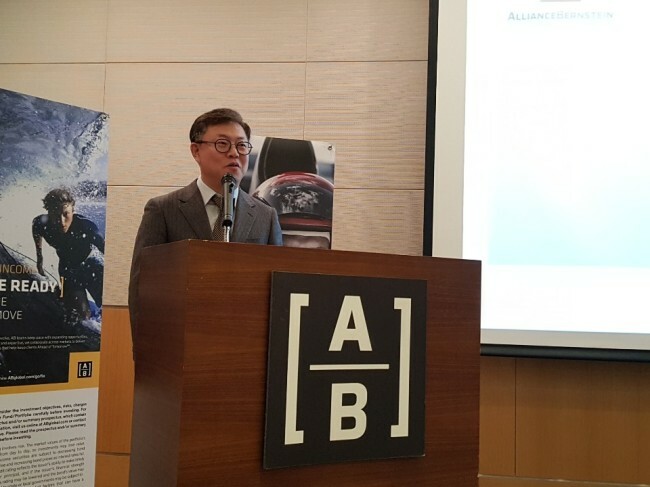 “Growth momentum is certainly slowing down but when it comes to the question (of) whether such slowdown means a possible recession, our answer is no,” said David Wong, a senior investment strategist at AllianceBernstein Asset Management Korea, at a press conference. Due to lowered investor expectations, one may now expect a relatively positive return on equity, especially in the US equity market and emerging markets, he said. Contrary to the perception that the US market no longer offers growth, the figures for the past five years clearly indicate that the US market offers an average return as high as 40 percent, according to Wong. A tangible sign of a bullish US equity market is the recent uptrend in top US companies’ buybacks of their own shares, he added. “The total buyback by S&P 500 companies in year 2018 is estimated to stand at an unprecedented $770 billion and is expected to climb to $940 billion this year,” he said. For emerging market investment, the strategist recommended a balanced regional approach instead of investment in a specific country or industry sector. Yoo Jae-heung, senior portfolio manager for fixed income, also advised Korean investors to spread out yields and risks through a diversified bond portfolio, in a “credit barbell” model. “In a volatile market situation, it is advisable to offset risks through stable state bonds and to maintain yields through credit bonds, operating a two-way strategy,” he said. Yoo also advised bond investors to patiently approach the market in a mid-term or long-term perspective, as market volatility is usually followed by improved valuation.